Have you ever felt creatively blocked? Do you sometimes wonder what successful writers and creators do to overcome challenges in their work? Is there a better way of internalising the teachings of creative people you admire so you can create and write just like them? A couple of years ago, I read the book The War of Art: Break Through the Blocks and Win Your Inner Creative Battles by Steven Pressfield. His book helped me figure out it’s natural to procrastinate and feel embarrassed about sharing my work with others. Then I moved onto something else, and I forgot some of these important creative lessons. I recently re-read the War of Art and re-discovered successful writers and artists use positive affirmations to remind themselves what’s important and to internalise the teachings of their betters. Since then, I’ve started using positive affirmations. I’ve found I’m less likely to forget what I read and that I can apply the teachings of my betters more easily. 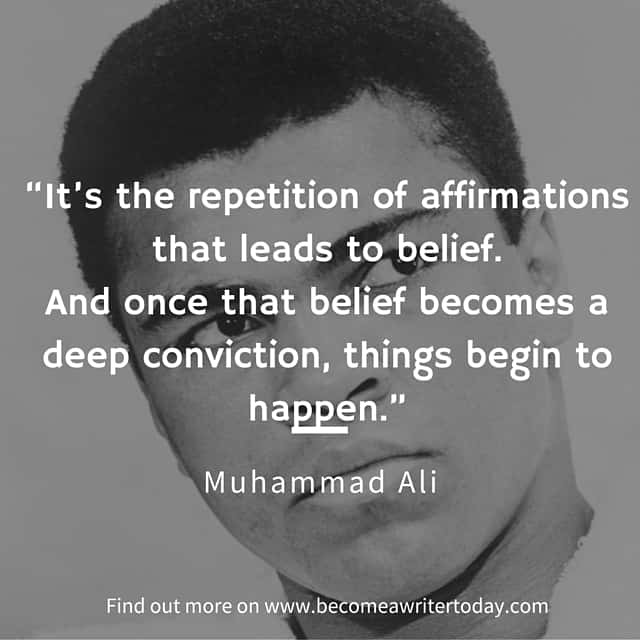 Affirmations are a powerful mental tool that professional athletes, creative professionals and writers use. The use of affirmations involves keeping helpful or positive ideas, sayings or thoughts about your personal or professional lives and re-reading or repeating them regularly. You can write an affirmation yourself or, alternatively, you can use the writings of other people to inspire you. Using a positive affirmation is like wearing a suit of armour into battle. When the slings and arrows of outrageous fortune are thrown your way, they will bounce off your suit of armour, and you can keep on going. You won’t stop because someone criticises your work, because your last creative project was a failure or because it’s just too damn hard. Top athletes use affirmations to help them break records, beat other athletes and achieve their goals. The American ultra-athlete Scott Jurek is a more contemporary example of a successful athlete who uses (less ego-centric!) affirmations to achieve his goals. Positive affirmations can help writers and creative people too. 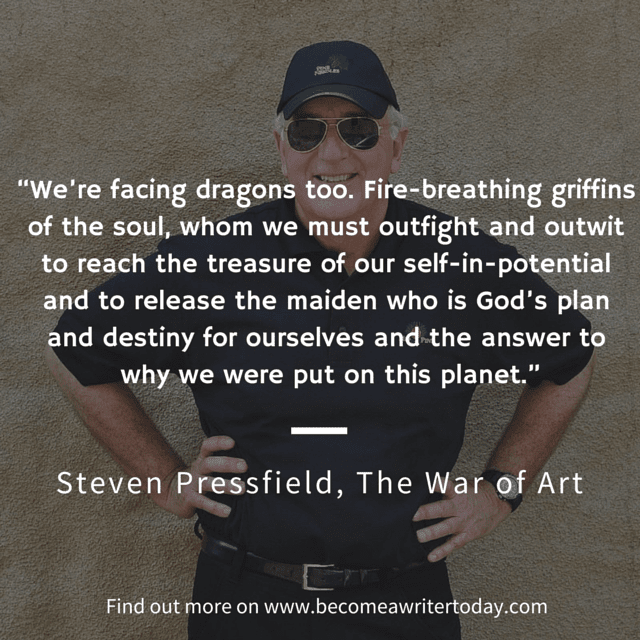 In The War of Art, the writer Steven Pressfield explains he recites an affirmation each to combat procrastination and to do his work each day. “The last thing I do before I sit down to work is say my prayer to the Muse. I say it out loud, in absolute earnest. Only then do I get down to business. You can use an affirmation for any area of your life as long as it’s relevant and personal. Your goal is to internalise the thoughts of your teachers and mentors, overcome creative challenges in your work, and use these affirmations as reminders for why you’re doing what you’re doing. For example in this post, the blogger, teacher and marketer Bryan Harris explains he read an affirmation out loud each evening before launching a new course for his audience. This practice helped Bryan Harris gain confidence and his course subsequently earned six figures. Affirmations are a personal thing and just because a type of affirmation works for one writer or artist, doesn’t mean it will work for you. To find your positive affirmation, underline passages that you don’t want to forget in the books you read. The Kindle is useful for this as it’s easy to go back, find and re-read these passages later on. You can also find passages that other people liked for inspiration. The next time someone praises your work or your writing, record what they said alongside your other affirmations. Now, when you feel like what you’re creating isn’t much good or when your work is criticised (and it will be), you can re-read this praise and remind yourself that what you’re doing is worthwhile. I keep affirmations that help me act on better ideas, write more frequently, publish my work, exercise and even prioritise what’s important and what’s inconsequential. Some of these affirmations are no more than one or two sentences while others, like Pressfield’s, are longer. To write an affirmation yourself, make sure it’s a strong statement or proposition that’s positive and relevant. Use active verbs (e.g. I will…, I am) and language that you won’t easily forget. I am the kind of writer who turns up every day, writes 1,000 words and commits to sharing my work with the world. If you need more examples, Dr. Carmen Harra provides over 35 on this Huffington Post article. What To Do With Your Affirmations? Affirmations are meant to be used and reviewed. You can record your affirmations in a journal, in a notepad, or in a file on your computer. I recorded several different positive affirmations for each area of my life in Evernote with the tag .affirmations. As I use Evernote daily, I can find my list of affirmations easily enough and re-read them regularly. You don’t have to recite your affirmations every day, but they won’t help you if you never look at them or use them. I find it’s helpful to read or even recite one or two of my affirmations before I write or when I’m facing a major creative challenge like writer’s block. Many people who use positive affirmations stop once they’ve found a few chest-thumping phrases they like. It’s not enough to recite a positive affirmation if you’re going to delude yourself about what’s realistic. Your affirmation should serve as an occasional springboard into asking realistic and constructive questions about your motivations and what’s possible. One of my favourite positive affirmations (and a helpful one for writers) is by Steven Pressfield. We're facing dragons too. 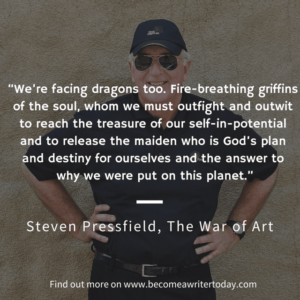 Fire-breathing griffins of the soul, whom we must outfight and outwit to reach the treasure of our elf-in-potential and to release the maiden who is God's plan and destiny for ourselves and the answer to why we were put on this planet. This affirmation reminds me of why I write and that other writers face the same creative challenges. Sometimes, I re-read this affirmation and use it to ask myself what’s my plan for outwitting the dragon today? It’s my suit of armour, and it’s one many writers can wear. Use it, take the time to find your positive affirmations and make them part of your creative life. You will become a better and happier writer and creator for it. Always having a positive affirmations for yourself helps a lot. The moment you fill your life with positive thoughts, things will start changing for you for good and that is just the fact. Always thinking negative thoughts will only get you one thing….. A negative filled life. So, its very important to always have positive affirmations about whatever you want to do. Committing it to memory every morning before waking up is also a good idea. Hi Theodore, I write them down in Evernote, this is great place to keep helpful information and research.